Explore the magical island of Mauritius with Mauritius Attractions extensive range of sightseeing tours. We offer you sightseeing tours to all regions of Mauritius which includes tours to the main touristic sights, beach tours, island tours, nature tours and many more. Mauritius Attractions offers some of the most popular and out-of-the-ordinary Mauritius tours. As part of these tours you will get to visit many highlights in one day, and to visit all the must-see sights in Mauritius. 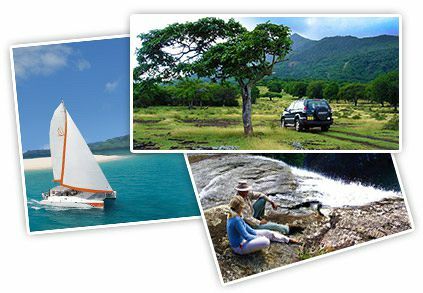 These tour packages are the best, cheapest, easiest and most time efficient way to explore Mauritius. Full day tour to Ile Aux Cerfs - day tour full of fun and relaxation! As part of this tour you will visit the popular island of Ile aux Cerfs. The tour starts with a boat transfer to Ile aux Cerfs Island, which is a beautiful island near the east coast of Mauritius. This amazing paradise island is the perfect setting for a relaxing day of sun worship. As you approach the island by boat, you will see the swaying palm trees and the pure white beaches framed by the vivid turquoise waters. Enjoy a day of relaxation and fun on one of the picture-postcard beaches or enjoy a swim and/or snorkel in the azure sea. You can also take advantage of the wide range of facilities on the island and the various water sports activities found there. After the visit to Ile aux Cerfs, you will travel by speed boat to the Grand River South East waterfall for a great view of the waterfall before heading back. The complete tour to discover the traditional Mauritius by following the Mauritian Tea Route. Awaken your five senses as you discover the making of teas, rum, vanilla, essential oils - and as you stroll down the exotic gardens of the Bois Cheri tea plantation. A guide will walk you around during your visit and will guide you on the history, stories and tales of all the sites. It is a trip that will take you back in time to the first days of Mauritius with its rich colonial history and you will get a chance to learn on the importance of tea productions in Mauritius. You will visit the “Domaine des Aubineaux” and its gardens. Domaine des Aubineaux is a colonial house built in 1872, which has been converted into a museum dedicated to the history of Mauritian Tea. You will discover, amongst others, furniture dating back to the 17th century, and a great collection of photos of colonial houses which have been demolished. Also, you will find several displays explaining the important role that the tea industry played throughout time. After the visit to the house, you will continue the tour and will visit its gardens - Camphor tree garden. While strolling in the Camphor tree garden, take a look at the diversity of exotic plants as well as trees of the endemic forest, and enjoy the beautiful sight of the tea plantation and of the breathtaking nature all around. Following the visit to the garden you will have a short break in the famous Tea room and enjoy the delicious buffet of tea & scones. The tour will continue with a visit to Bois Chéri which is the second stop in the Mauritian Tea Route tour. The Bois Chéri is the first and biggest tea producer in Mauritius, operating since 1892. After a guided tour of the factory, you will discover the history of tea while visiting the tea production museum. Nowadays Bois Chéri produces a new range of flavored teas, green teas and herbal teas. You may taste them during your visit, while enjoying a great panoramic view of the beautiful south of the island. You will then continue you tour to the third stop of the Tea Route - the Saint Aubin house. 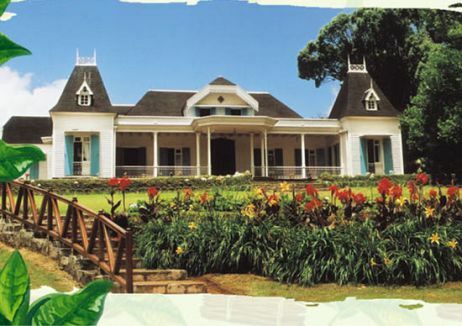 Built in 1819, It has been home to several managers of the sugar estate, before being renovated in the 90's to preserve a part of the Mauritian heritage. Today one may still see the beams and ship poles used in its original construction. The estate produces sugar canes, processed to make sugar as well as the delicious agricultural rum, the manufacture of which you may see at the distillery. You will also discover the interesting transformation process of the vanilla orchid: from the flower to the aromatic pod. The full tour takes 5-7 hours. As part of this tour you will visit many highlights in one day: Mauritius National Botanical garden, Sugar estate & Museum, the city of Port Louis, the Natural History Museum, Fort Adelaide and Caudan Waterfront. The Tour starts off in the Mauritius National Botanical gardens, home to an incredible variety of tropical plants, many of them indigenous. The Botanical Garden is one of the most visited attractions in Mauritius. It was first opened as a private garden by the French governor of Mauritius nearly 300 years ago. The garden stretches over endless acres of land and it can take you more than a week to cover the whole garden. The botanical garden is populated with more than 650 varieties of plants among which are the famous Baobabs, the palmier bouteille, the ineluctable giant water lilies, dozens of medicinal plants, 85 different varieties of palms, a big spice garden and many more. The tour will then continue to the Sugar estate and museum which stretches over 5000 square meters. In the estate you will discover the stories, tales and background on the sugar, such as: sugar throughout the ages, the history of sugar production and growing in Mauritius, manufacturing progress of sugar, the Sugar Routes- journeys of sugar and the history of commercial exchanges throughout the world and many more. You can also enjoy a selection of panorama videos and films on many sugar related subjects. Also, as part of your visit, you will have the opportunity to shop at the estate’s boutique - Don’t miss this great opportunity to enjoy, try, and to purchase a unique-local made special sugars, and the local made Mauritian rum! If you wish, you can also enjoy a lunch at the Sugar estate restaurant, where you can have a great quality lunch with a magnificent view of the Pieter Both Mountain. You will end the tour with a visit to Port Louis, which is the capital of Mauritius. It is the largest city in Mauritius and the economic and administrative center of the island. Port Louis has plenty of character. Right off the main square you can stroll besides the palm-lined Place d'Armes. You can see some wonderful French colonial buildings, especially the Government House and the Municipal Theater. In Port Louis you can also see few sightseeing attractions such as the: the Anglican and Catholic cathedrals, the main city Mosque, Chinatown, the lively covered market, the Supreme Court house, the 18th century Barracks and the Natural History Museum. If you fancy shopping then the Port Louis central market is a fun place to visit and the ideal place to find many local made products, textiles, Mauritian spices, fruits and many souvenirs for very cheap prices. If you prefer more upscale products then you can head to the Caudan Waterfront for a number of local and international stores. As part of this tour you will: Crocodile Farm & Nature Park, Bois Cheri- Tea Plantation and Factory, Saint Aubin Tea House, Grand Bassin, Mangal Mahadev- Shiva Statue and the village of Gris- Gris. It is a day full of fun, relaxation and of highlights and attractions in Mauritius! The first stop will be at the Crocodile Farm & Nature Park. The park which is home to various species of animals, reptiles and plants is set in a beautiful rain forested valley with natural freshwater springs, full of prawns and fish. During your stay in the crocodile park you can also experience a firsthand unique encounter with the giant tortoises (turtles), and get a rare chance to feed, pet and play with them. There is also a mini zoo of Mauritian fauna where you can find most of the Mauritian mammals and reptiles including skinks, phelsumas (geckos), tortoises, turtles, bats, deer, mongooses, monkeys, pigs, as well as domestic livestock such as goats, fat-tailed sheep and donkeys. A must see is the park's rare collection of butterflies and other brightly-colored insects (with about 23 000 species), which is one of the biggest and most fascinating in the world. The tour will continue with a visit to Bois Chéri which is the second stop in the Mauritian Tea Route tour. 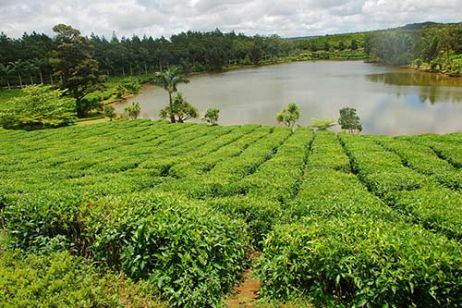 The Bois Chéri is the first and biggest tea producer in Mauritius, operating since 1892. After a guided tour of the factory, you will discover the history of tea while visiting the tea production museum. Nowadays Bois Chéri produces a new range of flavored teas, green teas and herbal teas. You may taste them during your visit, while enjoying a great panoramic view of the beautiful south of the island. You will then head to the Saint Aubin house. 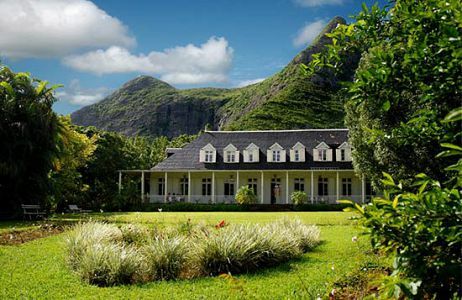 Built in 1819, It has been home to several managers of the sugar estate, before being renovated in the 90's to preserve a part of the Mauritian heritage. Today one may still see the beams and ship poles used in its original construction. The estate produces sugar canes, processed to make sugar as well as the delicious agricultural rum, the manufacture of which you may see at the distillery. You will also discover the interesting transformation process of the vanilla orchid: from the flower to the aromatic pod. Afterwards you will visit the holy lake of Grand Bassin. The lake is situated 6km South East of Mare aux Vacoas in a secluded mountain area in the district of Savanne, deep in the heart of Mauritius. It is about 1800 feet (550m) above sea level. Grand Bassin with its Hindu temple is a holy lake for Mauritians of Hindu faith. The lake rests in the crater of an extinct volcano. Beside Grand Bassin you will also get to see the statue of Lord Shiva Statue- Mangal Mahadev. The statue is of 108 feet (33 meters) and is the highest known statue in Mauritius (and one of the 50 highest statues in the world). The sight of the Mangal Mahadev statue is quite impressive as it is a beautiful crafted very big statue. The tour will continue to the cliffs of Gris-Gris of Souillac, found on the Southern tip of Mauritius. Gris Gris received its name for its gloomy and moody atmosphere which you will find all year round. This is the only place in Mauritius where there is an opening in the barrier reefs circling Mauritius. And accordingly, the only place you can see the big waves reaching the shores and crashing on the cliffs. As part of this tour you will visit: Floreal, Trou aux Cerfs, Curepipe, Mare aux Vacoas, Grand Bassin, Black River Gorge, Chamarel (seven-colored earth), view of point Le Morne, Casela bird park. The first stop is Floreal, where you will visit local handcrafts workshops, such as the wool facotry, a model boats workshop, a diamond cutting workshop and more. During your visit you will see the various steps of garments making. Be enchanted by the soft touch of materials, learn the technical aspect of machinery, and be amazed by the artistict work done by the people at work. Many of the boutiques and factory shops in Floreal offer a vast range of products. You will be able to puchase at competitive prices hand made craft, watches, paintings and top designer garments and many more, all directly from the manufactures. You can also take a break on a beautiful terrace while enjoying a wonderful meal or drink in the peaceful atmosphere of the centre. From Floreal heading to Curepipe, you will stop on the way to visit the Trou aux Cerfs ( extinct volcano ). This huge natural volcanic crater, 85m deep and 200m wide, was formed millions of years ago. There you will have a beautiful panoramic view of the crater and of the town of Curepipe, and when the sky are clear, even see all the way to Reunion Island. 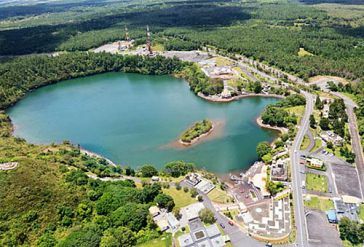 From Trou aux Cerfs you will continue the tour visiting the town of Curepipe, and then the Mare aux Vacoas, the biggest natural water reservoir of the island. There lies the mysterious and enchanting Grand Bassin, a holy lake for Mauritians of Hindu faith. It is said that the water inside the lake communicates with the waters of the holy Ganges of India. The Hindus declared the Grand Bassin as a Holy lake. The Hindu community performs there a pilgrimage every year on the Maha Sivaratri/“Siva’s Great Night”, on this day they honor the Lord Siva. From there the tour continues to the Black River Gorges natural park, where it is possible to see many endangered species of plants and animals, and to enjoy a breathtaking viewpoint of Alexandra falls. 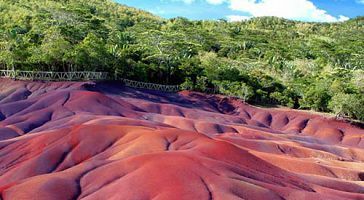 Then, reach one of the wonders of Mauritius and definitely one of the must things to see – the Seven Colored Earth of Chamarel. The landscape is truly unique and there is also a great view of the neighboring Chamarel falls and the lush vegetation all around. The final stop of this tour is at the Casela Bird Park. This park, on an area of about 25 hectares, is home to more than 150 bird species from many different continents. The Pink Pigeon, one of the rarest species in the world, is one of the main attractions. The park is also home to many tigers and monkeys. Most amazing collection of orchids will accompany you on your stroll around while also enjoying the meandering streams, lush nature, cascades and fishponds. As part of this tour you will visit: Vieux Grand Port, Biscuterie H Rault (Manioc Biscuit Factory), Eureka House, the town & museum of Mahébourg and Blue Bay beach on the South-East coast of Mauritius. You will first visit the Vieux Grand Port (or the Old Grand Port) located in the north of the town of Mahebourg, which served as an excellent port city for trade. It later witnessed the historical Vieux Grand Port Naval Battle in 1810 which was fought between the French Navy and British Royal Navy for the possession of the harbor. Next you will visit the Biscuiterie H Rault -a unique biscuit factory, located in the south-east of Mauritius. The family owned factory specializes in the production of cassava (locally known as manioc) biscuits. For over 140 years, the factory has followed the traditional method, producing a wide variety of flavored cassava biscuits. You will have the opportunity to witness the century-old recipe in the making and may even run into one of the family members. You will then visit the Eureka House. Eureka is a unique house and museum built in 1830 located by the river of Moka. This house with 109 doors is interesting for its antique furniture, old photographs, china and architecture. Worth seeing is the beautiful garden surrounding the house with beautiful flowers, majestic waterfalls, and the endemic plants. The next stop is the traditional Mauritian village of Mahebourg. Mahebourg is named after Bertrand François Mahé de La Bourdonnais, one of the most successful governors of the French period. The well-planned wide streets in the old section of Mahébourg still bear testimony to the Dutch and French colonial past. You will visit the Historical Naval Museum which recounts the epic naval battles of the past between the Royal Navy and the French Navy. Today Mahébourg is a bustling centre of local trade. The new waterfront complex will offer you to enjoy memorable walks along the sea side. You will continue the tour with a visit to the beautiful Blue Bay beach with its crystal clear turquoise blue water. It is considered one of the most beautiful beaches in Mauritius. Blue bay is the perfect place for relaxation, swimming and snorkeling, as it is considered the best place for snorkeling in Mauritius. Full Day of shopping tour in Mauritius- Shop Till You Drop! As part of this tour you will visit: Port Louis, Phoenix, Goodlands, and/or Grand Bay- which are the best places to go shopping in Mauritius. Shopping in Mauritius - Mauritius has a reputation of being a shopping paradise. Whether it is textiles, jewelry, handcrafts, or many other desired shopping items, you will probably find what you are looking for in Mauritius and for very attractive prices. Mauritius for many years, has a reputation of being a manufacturer of quality textiles, uniquely designed jewellery, a wide range of handcrafts such as: artificial flowers, model boats, wooden art and many more. All this makes Mauritius a shopping paradise offering very high value-for-money on your shopping, and turns the shopping experience into a very interesting and enjoyable one. In this tour, you will discover the various shopping centers, arcades, duty free shops, markets, jewellery shops and arts & crafts boutiques Mauritius has to offer. At the Mauritius Glass Gallery situated in Phoenix, you will enter the amazing world of glass blowing and glass ornaments. Purchase durable, aesthetic pieces of glass at very affordable prices directly from the factory shop. Ash trays, decanters, wine & rum glasses, candle holders, indoor plant holders, lamp shades, soap dishes and many more products are available. Do not worry if what you want is not in the showroom or shop as you can even customize an order (personalized products will be ready after 3 days either by delivery of direct collection from the gallery). At the capital city of Mauritius, Port Louis, you will be spoilt for choice with the number of shops available. You will get a very different shopping experience visiting the Port Louis central market – the market is the ideal place to find many local made products, textiles, Mauritian spices, fruits and many souvenirs for very cheap prices If you are looking for a more relaxed shopping environment, then visit the Port Louis Waterfront and the Le Caudan Waterfront shopping Complex. This bustling area offers exciting shopping and entertainment venues which intermingle with world-class hotels and restaurants overlooking the Port Louis Harbor. The Le Caudan Waterfront shopping complex with its 170 boutiques, is a shopper's must visit and the center for local artists and Mauritian artifacts. If you are on the search for luxury jewellery mixed with art and tradition then the Poncini Jewellery Shop should be on your list. Established at the time of the French colony period, Poncini is now a leader in luxury trade and exports over the world. The Poncini artists create a unique collection of trendy necklaces, bracelets, rings, earrings, toe tings and anklets with gold, silver, diamonds and precious stones. Jewellery can also be customised. To benefit all shoppers, everything sold at the Ponicni shop (at Port Louis) is duty-free and VAT-free. At the Historic Marine showroom in Goodlands, you will find all the ship models, products of undisputable quality and extreme detail. Since 1982, Historic Marine has been perpetuating the art of ship modeling in Mauritius, first brought to Mauritius by sailors who enjoyed shaping those ‘little boats’ during their free time. After you purchase a model, there is a quality control before the ship is brought safely packed to the airport. Products at the Historic Marine are duty-free so when purchasing any of the models, you are sure to enjoy duty-free and VAT-free shopping. You will then have the opportunity to visit either the Grand Bay Shopping Village or the Goodlands Shopping Village. Goodlands is known for its shopping facilities and weekly markets. You can find the latest Indian fashion, designer sarees, jewellery, statues of Hindu deities amongst western clothing and souvenirs. 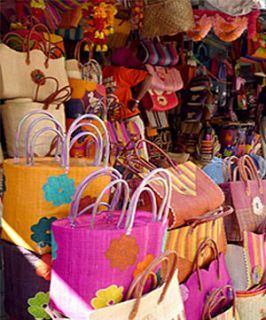 On Tuesdays and Fridays, the local market showcases all types of clothing, textiles, accessories and household products. The resort town of Grand Bay offers a large choice of fashion and craft shops amongst its hotels and restaurants. Modern shopping malls and traditional shops make Grand Bay the top shopping destination of clothes, jewellery, textiles and souvenirs. Enjoy a full day Exclusive sightseeing tour in Mauritius in a private car. The full day private tour includes full transportation to all the sights, pick up and drop off from any hotel in Mauritius and a driver to show you around. A personal driver will take you for a full day private sightseeing tour in Mauritius according to your requirements and wishes. These tours include key tourist sights, attractions and place of interest in the South, West, North or East of Mauritius, accompanied by a professional, friendly and knowledgeable driver. Car Capacity: Up to 4 passengers can go on this private tour in each car. All taxi drivers speak fluent English and French. The drivers, citizens of Mauritius, will be happy to provide you with information about Mauritius and each of its sights. In addition to the driver we can also provide a professional personal travel guide to join the tour and sit beside the driver. The personal guide will walk along side you and will offer personal guidance in each of the locations, provide insights on each of the sights and information about Mauritius, its history, culture, traditions, places of interest, and more. As part of this tour you will visit many highlights in one day: Mauritius National Botanical Garden, Arsenal Shopping Boulevard, Sunset Boulevard Shopping Complex, Grand Bay: Coeur de Ville & Richmond Hill, Grand Bay Bazar, Cap Malheureux and Mont Choisy Beach. 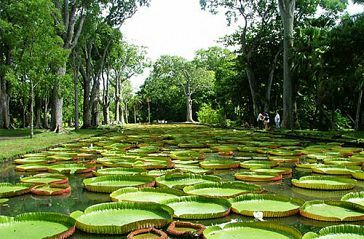 The first stop will be one of the most visited sites in Mauritius, the Mauritius National Botanical Garden. The botanical garden is home to an incredible variety of tropical plants, many of them indigenous- it is populated with more than 650 varieties of plants among which are the famous Baobabs, the palmier bouteille, the ineluctable giant water lilies, dozens of medicinal plants, 85 different varieties of palms, a big spice garden and many more. As part of the tour, you will get to explore the Botanical garden and have a taste of their beauty. The tour will continue to Arsenal, a small village in the district of Pamplemousses where you will visit the shopping areas. Many of the boutiques and factory shops in Arsenal offer a vast range of products, of which many are “Made in Mauritius”. You will visit local handcrafts workshops, such as a model boats workshop, and more. After your shopping tour in Arsenal, you will visit the touristic town of Grand Bay. Grand Bay, is a popular seaside town with many tourist beaches in the north of Mauritius. Grand Bay owes its popularity to the enchanting quality of its emerald waters and to its liveliness by day and by night whilst also offering a large choice of fashion & craft shops, hotels and restaurants. You can find traditional local shops, some operating for almost 50 years, alongside modern shopping centres and worldwide brand shops. Considering the variety of shops and shopping complexes, Grand Bay is definitely a top shopping destination for clothes, jewellery, textiles and for souvenirs. The Sunset Boulevard Shopping Complex is the perfect place for shopping lovers where you can enjoy duty free shopping and find all the leading local brands, as well as many international brands. You can buy souvenirs, textiles and many local products here. There are also several high-end jewellery stores. Grand Bay: Coeur de Ville, you will get almost everything that you can imagine from food to souvenirs, snorkelling equipment, clothes, shoes, books, magazines and many more. Richmond Hill, another shopping complex just to the left of Grand Bay: Coeur de Ville, has the very famous Adamas diamond and jewellery shop. This is great place to shop for jewellery, watches and many other high-end accessories. The Grand Bay Bazar bustles with plenty of shops and stalls. There you can find mainly the typical souvenirs and many local made products along with a variety of cheap clothing and accessories. Your tour will end with a visit to Cap Malheureux, famous for its red-roofed chapel and incredible views of the northern islets and with a visit to the popular beach of Mont Choisy. A full day Historical Tour to the North-West and Central regions of Mauritius. As part of this tour you will visit: The Sugar Museum and Factory, Port Louis, Aapravasi Ghat, Eureka House and the Mauritius Glass Gallery. It is a day full of discovery and fun! The first stop will be The Sugar Museum and Factory which is an endorsement of the key role that sugar played in the history and identity of Mauritius. In the estate, you will discover the stories, tales and background on sugar, such as: sugar throughout the ages, the history of sugar production and growing in Mauritius, the manufacturing progress of sugar, the Sugar Routes- journeys of sugar and the history of commercial exchanges throughout the world and many more. Don’t miss this great opportunity to enjoy, try, and to purchase a unique-local made special sugars, and the local made Mauritian rum! Enjoy a visit to Port Louis - the capital city of Mauritius and the island’s largest economic, cultural, political and administrative hub. A wander around the historical town with its stone pavements, and the nation’s main harbor will open your eyes to the old days of Mauritius. Right off the main square, you can stroll besides the palm-lined Place d’Armes and can also see some wonderful French colonial buildings, such as the Government House and the Municipal Theater. Located next to the port is the Aapravasi Ghat, one of the two Mauritian sites inscribed on the UNESCO World Heritage List. In 2001, the site was named Aapravasi Ghat - which in Sanskrit means "shore or immigration depot”. This historical site is a symbol of Mauritian identity since the ancestors of more than 70% of today’s local population arrived on the island through this immigration depot. The depot was created to receive indentured laborers coming to work in the sugar plantations during the early post-slavery years, 1834-1920. The next stop will be Eureka House, a unique Creole house built in 1830 located by the river of Moka. It is an elegant Créole residence originally owned by British and French aristocrats in the 19th century. It is reputed to be one of the largest houses on the island, with 109 doors and windows. The visit of the Eureka Mansion and its grounds provides an intriguing glimpse into colonial life with antiques and photos of the period. It also has a magnificent garden surrounded by waterfalls of the Moka River. As part of the visit, we offer you to enjoy a delicious lunch and a unique dining experience at the Eureka House restaurant which specializes in traditional Mauritian cuisine. Your tour ends at the Mauritius Glass Gallery where you will see skillful craftsmen setting their creativity free and bringing used bottles and other glass elements back to life. You will also familiarize yourself with the traditional and centuries’ old techniques of glass blowing. At the glass museum which is situated between the workshop and the gallery, you will enter the amazing history of glass blowing, and get an insight into the natural part of Mauritius. A full day tour to the beautiful South-East area of Mauritius. As part of this tour you will visit: The Sugar Museum and Factory, Port Louis, Aapravasi Ghat, Eureka House and the Mauritius Glass Gallery.As part of this tour you will visit: The Blue Bay Marine Park, Ile aux Aigrettes, the city of Mahebourg and the Blue Bay Beach. You will first visit the Blue Bay Marine Park through a glass bottom boat trip. The Blue Bay Marine Park, situated on the South-East coast of Mauritius near Mahebourg, is one of the best places to see the beautiful marine life of the island. At the Marine Park, you can decide whether to stay aboard the boat and observe from the glass bottom or to jump into the water for some swimming and snorkeling. You will have a great view of the reef, fish and of a large selection of coral (there are more than 50 different species of coral at the park! Next you will enjoy a short boat trip to Ile aux Aigrettes- a tiny coral island (25 hectares) just off the coast of the town of Mahebourg. The island has been declared a nature conservation site and is being preserved by the Mauritian Wildlife Foundation. You will discover plants and animals, unique to Mauritius and found nowhere else in the world. There you should look out for the rare pink pigeon, the Mauritius Kestrel, endangered skinks and of course, the giant tortoises. You will also visit the indigenous plant nursery. Once back on the island, you will visit Mahebourg, named after the most successful French governor in Mauritius during the colonial period. The well-planned wide streets in the old section of Mahébourg still bear testimony to the Dutch and French colonial past. Today Mahébourg is a bustling center of local trade. The new waterfront complex enables you to enjoy nice, refreshing walks along the sea side. You will have free time to travel the city streets and enjoy shopping at the city center. You can also visit the Historical Naval Museum which contains the reminiscences of the French colonial empire and the replicas of the ancillary that were used in the historical battle. Your tour will come to an end with a visit to the Blue Bay Beach. Situated on the southeast coast, not far from Mahébourg, Blue Bay offers a fine stretch of white sandy beach, and deep, clear, light-blue water. 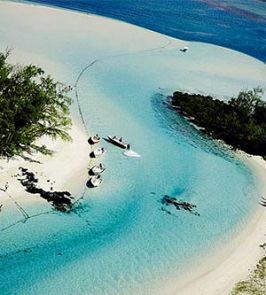 With its crystal clear, turquoise-blue water, it is considered one of the most beautiful beaches in Mauritius. The beach is perfectly suited for swimming and relaxing. It is also possible to enjoy a very nice stroll along the beach seeing small beautiful bays away from the public. Blue Bay is considered one of the best displays of color variety, changing constantly from sunrise to sunset. A full day tour to discover the leisure parks in the southern regions of Mauritius. As part of this tour you will visit: Casela Nature Park, a viewpoint of le Morne Brabant & Ile aux Benitiers, Chamarel village, Seven-Coloured Earth, Chamarel Waterfalls and the Curious Corner Chamarel. The first stop of the Mauritius Leisure Parks & Fun Tour is the Casela Nature Park. This scenic nature park situated besides the Rempart Mountain, is repeatedly described as the leading attraction in Mauritius. Spread over an area of 250 hectares, the Casela park is home to a number of indigenous and exotic animals, including the Big Cats, Giraffes, Camels, farm animals, birds and many more. The dynamic and vibrant park stands out for its diversity of leisure activities including authentic safari tours, speedy rides on off-road vehicles and extreme adventures taking you up in the air and above the forested lands. As part of this tour you will be able to see the iconic, Le Morne Brabant Mountain, situated on the Le Morne peninsula, at the extreme southwestern tip of Mauritius. It is one of the most popular tourist attractions in Mauritius and a UNESCO World Heritage Site. This majestic basaltic mountain with a summit of 556 metres (1,824 ft.) bears enormous cultural significance for the islanders. From the same viewpoint, about 500 metres off the coast at La Gaulette (South West of Mauritius) is l'ile aux Bénitiers- a large coral-sand island approximately 2 kilometres long, 500 metres at its widest point and 65 hectares in area. Chamarel is a village in the southwest of Mauritius with a population of about 700 people. It is primarily known for its scenic locations and natural attractions within its vicinity. Among them are the Seven-Coloured Earth, the Chamarel Falls and the Black River Gorges National Park. The Seven-Coloured Earth is a natural phenomenon and a prominent tourist attraction. It is a relatively small area of sand dunes comprising of seven distinct colours of sand (variant shades of red, brown, violet, green, blue, purple and yellow). Known as the highest waterfalls of Mauritius, the Chamarel Waterfalls has a height of about 100 meters (almost the same height as the Statue of Liberty) cascading down against a scenic backdrop of luxuriant forests and mountains which is simply breath-taking. Formed by the river St.Denis, the river flows through fields, gorges and green spaces, seawards and makes for a splendid view. Located just opposite the Seven-Coloured Earth entrance in the Chamarel village is a house filled with a variety of astounding delusional fantasies- the Curious Corner Chamarel. Curious Corner, as the name states is for those of us who like snooping around and have an ever-probing mind, as we all naturally are. The house is filled with fun packed illusions and adventures to be enjoyed with friends and family. A full day tour to discover the picturesque sites in the southern village of Chamarel, Mauritius. 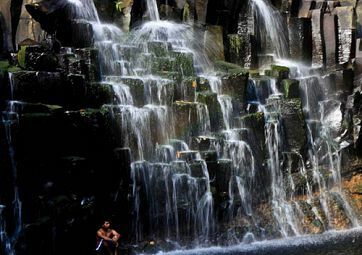 As part of this tour you will explore the Ebony Forest, view the Chamarel Waterfalls, visit the Seven-Coloured Earth, the Rhumerie de Chamarel and the Curious Corner Chamarel. The first stop of the tour will be at the Ebony Forest, where you will explore the forest reserve for about 2 hours. You will get to discover the few native plant and animal species remaining on the island through a guided tour or on your own with the help of informative signs along the way. Two mid- canopy walkways through the ebony forest will give you the surreal sensation of floating through one of the best-preserved forests and the Sublime point will offer you breathtaking views of Le Morne. Next you will view the highest waterfall of Mauritius, the Chamarel Waterfall. With a height of about 100 meters (almost the same height as the Statue of Liberty), the waterfall cascades down against a scenic backdrop of luxuriant forests and mountains. The sight of this impressive waterfall against the scenic forests and mountains is truly breathtaking. The Seven-Coloured Earth is a natural phenomenon and a prominent tourist attraction. It is a relatively small area of sand dunes comprising of seven distinct colours of sand (variant shades of red, brown, violet, green, blue, purple and yellow). Since the earth was first exposed, rains had carved beautiful patterns into the hillside, creating an effect of earthen meringue. When visiting the park, you will be able to walk between the many sand dunes and contemplate this unique sight. You will then visit the Rhumerie de Chamarel, a rum distillery in the heart of a fertile valley. As part of the tour of the Rum Distillery, you will discover the exclusive Rum making process where all the sugar cane plants are carefully selected and grown at the domain. One of the highlights of the distillery’s guided tour is definitely the Rum tasting. At the end of the tour, unique rum tastings are offered where one can try the selection of the agricultural Rums produced by the distillery. The tour will end with a visit to the Curious Corner Chamarel. Located just opposite the Seven-Coloured Earth entrance in the Chamarel village is a house filled with a variety of astounding delusional fantasies. Curious Corner, as the name states is for those of us who like snooping around and have an ever-probing mind, as we all naturally are. The house is filled with fun packed illusions and adventures to be enjoyed with friends and family.